Ocean sailing has come a long way since 1522 when the lone surviving ship of Ferdinand Magellan’s fleet (minus Magellan) limped back to Spain, completing the first successful around the world journey. No event exemplifies this progress more than the Volvo Ocean Race. Participants in this grueling around-the-world stage race enjoy advantages far beyond what Magellan could have possibly imagined. The boats are technically advanced and built for speed and durability. Satellites pinpoint their positions and progress. Internet feeds provide the latest weather forecasts and ocean conditions. Instant communication keeps race participants in contact with the rest of the world. Advances in medicine and nutrition keep the crews healthy. And finally, today’s racers can draw on the experiences of the countless sailors that have gone before them. But despite these advantages, today’s sailors must navigate the same hazardous ocean conditions that Magellan’s fleet faced. Wind and waves can smash a boat and toss a sailor overboard, while calm winds can stop a boat in its tracks. Illnesses and injuries still can sap a crew. And if something does go wrong out in the vast ocean, help can take a long time to arrive. The pressures of the race only accentuate these dangers. The sailors must operate at full speed and make split second decisions 24 hours a day. The longest leg took nearly six weeks to complete. So just as in Magellan’s time, knowledge of winds and currents not only gives the racers an edge, but also is essential for a safe journey. In the inaugural race, which was originally dubbed the Whitbread Round the World Race, 17 boats set sail from Portsmouth, England, in 1973. By the time the boats arrived back in Portsmouth at the end of the fourth leg, three sailors had been lost overboard. Despite this rough beginning, the race continued and is now staged every four years. The 2008–2009 race started from Alicante, Spain, in October and will finish eight months later in St. Petersburg, Russia. By then, teams will have completed ten legs and sailed 37,000 nautical miles. 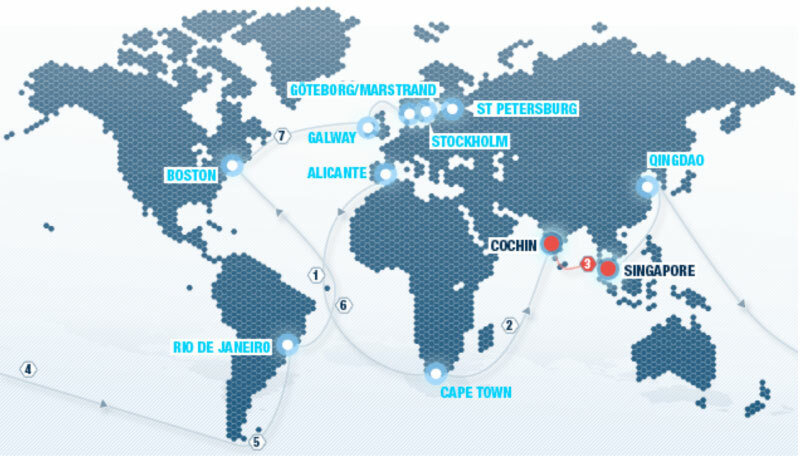 Ports include, Cape Town, Cochin (India), Singapore, Rio de Janeiro, and Boston. Teams are awarded points based on the order in which they finish each leg. Because times are not cumulative, each leg constitutes a race in itself, heightening the competition. Points are also awarded when the boats pass through scoring gates in each leg. Six of the stop-overs also feature in-port races. There are many factors that go into winning the race. But teams that spend the most time and money preparing gain a significant advantage. Boats must be painstakingly built and tested. Every pound must be accounted for. Sails must be designed to take the fullest advantage of a wide variety of conditions. Crews must be chosen not only for their skill and experience, but also for their ability to get along and work well together. Even the choice of food is critical given that boats cannot restock in the middle of a leg. Yet it is the strategic aspect of the race that provides some of the most compelling drama. A close race can come down to which team positions itself to take the best advantage of the winds and currents. Every leg presents obstacles. In four of the legs, boats must traverse the Intertropical Convergence Zone, better known as the Doldrums. This band of low pressure where the north and south Trade Winds meet is infamous for calm winds punctuated by nasty convectional thunderstorms. Racers must make the strategic decision of whether to maintain their course through the Doldrums and therefore sail the shortest distance, or deviate from their course to find the narrowest point to cross. Strong surface currents present a different sort of obstacle. Strong winds blowing opposite a large current can generate towering waves capable of sinking the largest ships. Race organizers designed the Leg 2 route from Cape Town to Cochin to avoid the most dangerous current, the Agulhas Current, which runs south along the eastern African coast. Storm-generated waves crashing into this current have been known to exceed 100 feet. The racers, however, were not able to avoid the Kuroshio Current in Leg 4 as they sailed north from Singapore to Qingdao, China. The Kuroshio Current, the Pacific Ocean’s answer to the Gulf Stream, flows north, aiding the sailors. But as the boats entered the Luzon Strait, they collided with 50-knot winds blowing from the northeast. Waves crested as high as 50 feet. Only five of the seven boats completed the leg, while all seven boats sustained damage. Tidal currents, along with unpredictable winds swirling off the mainland, make the passage through the North and Baltic Seas towards the end of the race tricky. The Gulf Stream - The animation focuses on the Gulf Stream (a major surface current). Note the black colors indicate the warmest ocean surface temperatures and and light blues indicate the coolest temperatures. Sea surface temperature (SST) simulation from the Geophysical Fluid Dynamics Laboratory's (GFDL) high resolution coupled atmosphere-ocean model. Credits: Anthony Rosati (GFDL) and Chris Kerr (GFDL), Princeton University. The Gulf Stream, on the other hand, provides a significant boost to sailors crossing the Atlantic Ocean from Boston to Galway, Ireland (Leg 7). Because the prevailing winds, which circle counterclockwise around the Iceland Low to the north, blow with the current, the seas generally remain calm. These ideal sailing conditions jeopardize the 24-hour speed record. For much of the race, however, the teams do not grapple with such dramatic conditions. Instead they work to position themselves to take the best advantage of the winds and to a far lesser extent, the currents. They have a great deal of information with which to work. Prior to the race, they spend a lot of time researching the best routes based on global weather patterns and the experiences of the many ships that have gone before them. Then once the race begins, each boat receives the latest weather forecasts and information on ocean currents and sea conditions every six hours. Instruments on each boat measure weather and ocean conditions and calculate wind speed and direction. In addition, every three hours, each boat receives information on the positions of their rivals, the wind conditions, and the speed and direction they are moving. Each boat’s navigator then enters the data they receive into a program that calculates the fastest route to a designated point. As the conditions and forecasts changes, the navigators can recalculate their routes. Wind speed and direction are the most important variables, but currents also factor into the algorithms. Occasionally, teams stray from this script. During the eastern traverse of the southern ocean from China to Brazil, boats traditionally dip south to pick up the westerlies. Ninety-nine out of one hundred times, this is the fastest route. Yet during this run, the large high-pressure system to the north slipped south. The computer models started generating routes that passed over the top of this high-pressure system. At first, nobody trusted these forecasts. They had seen these situations develop and dissolve before. Then one boat, piloted by the youngest and most inexperienced skipper, broke from the pack and veered north. What followed was a psychological game of who would break first to follow this rogue boat north. Eventually, everybody followed, with the last boat having to make the sharpest turn. Magellan and his crew certainly encountered challenges not faced by the participants of the Volvo Ocean Race. Mutinies, scurvy, political bickering, and the needless and foolish involvement in a foreign conflict crippled the voyage and led to Magellan’s demise. Yet at the most basic level, both Magellan and the racers shared the same basic challenge. Success depends on the ability to read and react to the ocean. I’d like to thank Mark Chisnell for getting me up to speed, and the web developers and writers who put together the exhaustive and endlessly fascinating Volvo Ocean Race website.